The earliest mining process was the digging of Bell Pits. 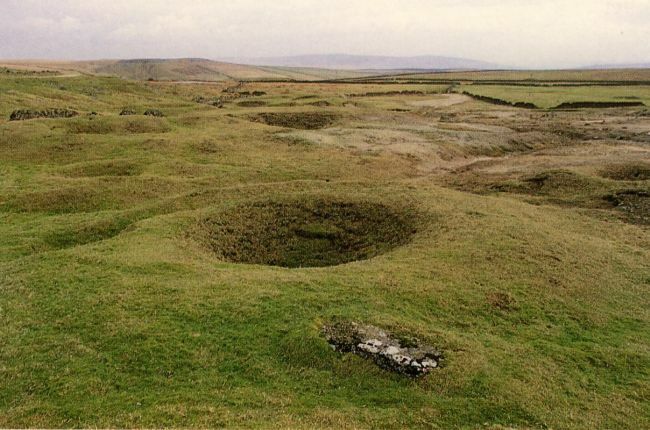 These appear today as circular depressions in the ground occurring at intervals along straight lines, but can often be confused with the natural shake and swallow holes in limestone. Lead ore usually occurs as vertical veins. Miners identified these veins at the surface in flat areas and dug a hole to expose the ore. As they dug deeper they reached a limit when it became difficult to remove the waste by shovel and the walls of the pit became less stable. They dug vertically down into the rocks opening a small shaft and ultimately a bell shaped chamber underground, removing waste by use of a hand winch (a jack roller or windlass) with a bucket (known as a kibble). As they reached the limit of ore or the limits of practical working they would move along the surface following the vein of lead and start new bell pits. Spent Bell Pits were often sealed off with wood and then back filled to stop sheep falling in but this process has left a dangerous legacy as the wood has rotted. Bell Pits were little use on steep hillsides and so the method of hushing was used and continued into the 19th Century. 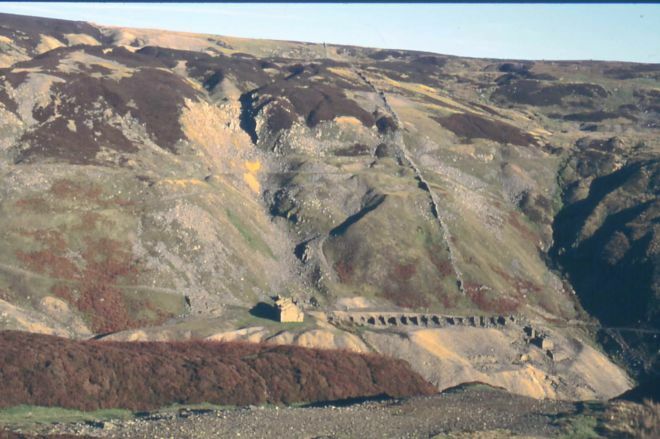 Hushes can be seen today as large scarred areas (usually gullies) on hillsides, with particularly prominent examples visible along the sides of Gunnerside Gill in Swaledale. The method involved building a dam near the top of the area to be cleared allowing water to collect from natural streams, rainwater and diverted water. When there was sufficient water the dam was broken, allowing the water to scour away the topsoil and small boulders exposing veins of lead which could then be exploited from the surface.